The weather here in Flagstaff has gotten better every day we have been here. Sunday night’s low was above freezing and yesterday’s high was 72; even the wind was just a light breeze today. If the weather gets any better we will be calling a realtor. :-) (Just kidding). While we were in Wupatki National Monument which is at about 5,000 feet elevation we saw the thermometer hit 81. However last night the low was in the 40s but, the wind was so strong that it shook the trailer and knocked down the satellite dish. In all of the wind we have had since we got the satellite dish it has never fallen before. About twenty miles north of Flagstaff are two National Monuments Sunset Crater and Wupatki, today we went to see them. 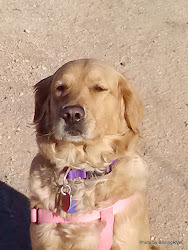 Our streak of dog friendly parks has been broken, both national monuments say that dogs are not permitted in buildings or on trails and that they shouldn’t be left in cars. 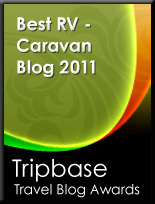 In reality they aren’t all that people friendly either because they also prohibit any off trail or back country travel as well. Poor Raider had to stay and guard the trailer. Fortunately, we weren’t that far away and he had both Fantastic Fans running to keep him cool. 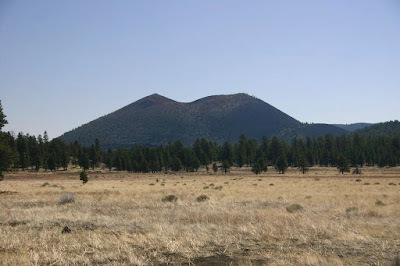 Sunset Crater is a giant cinder cone volcano that was born in a series of eruptions sometime between 1040 and 1100. It is one of about 600 volcanoes in this area. They do have a nice trail through a lava flow and cinder field, but the actual Sunset Crater Cinder Cone has been closed to hiking for the past 30 years. This was due to eroding the crater from foot traffic all over the sides. In the lava flows and cinder fields archeologist have found the remains of pit houses build by the Sinagua – Pueblo people. Wupatki National Monument contains several ruins sites from the Sinagua – Pueblo culture. All of these sites date from after 1140 when Sunset Crater last erupted. The belief is that the people living near Sunset Crater moved further south to Walnut Canyon National Monument area or north to the Wupatki National Monument area. 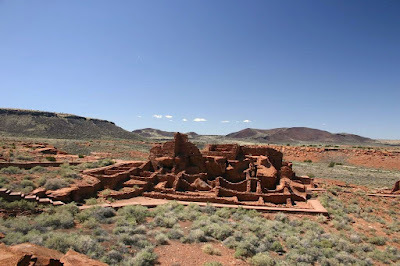 Although called Wupatki National Monument there are several other sites beyond the actual Wupatki Pueblo. Wuaptki Pueblo was a 100-room pueblo with a community room and ballcourt. As many as 85 to 100 people lived at Wupatki Pueblo, the largest building for at least fifty miles. Within a day's walk, a population of several thousand surrounded Wupatki. Unlike the cliff dwellings we saw at Walnut Canyon and at Montezuma’s Castle the structures at Wupatki were all built of stone and set in very prominent spots. I realized that I haven’t written much about birding as of late and I guess it is because we are always birding no matter where we go or what we are doing. We seldom go anywhere without our binoculars. Here is a list of some of the year birds we have seen over the past two weeks: Broad-winged Hawk, Golden Eagle, Merlin, Prairie Falcon, Horned Lark, Rock Wren, Sage Thrasher, Pygmy Nuthatch, Loggerhead Shrike, Steller's Jay, Western Scrub-Jay, Black-and-white Warbler, Harris’s Hawk and Pine Siskin. We are currently at 151 birds for this year’s bird list. Ah, yes. I was a bit disappointed to find that hiking was pretty restricted in these parks. They offer no great hiking experiences.